PR experts for toy, game, juvenile gear manufacturers and retailers. We provide a hands-on, personal approach to every client. Specialty toy, game, juvenile product, technology, and service businesses. We offer many services to meet your needs. Smart Toys and Games, Inc.
San Francisco, CA (October 29, 2018) – Specialty toy maker SmartMax, a division of Smart Toys and Games, Inc., is betting the farm as it heads to the American International Toy Fair. SmartMax launched its My First series of magnetic building sets last year with My First Animal Train and My First Safari Animals. The mix and match sets exceeded all expectations, and My First Safari Animals is a Finalist for The Toy Association’s 2018 Specialty Toy Of The Year. To continue delighting youngsters (and retailers), SmartMax introduces My First Farm Animals ($19.99) and My First Tractor Set ($24.99). Retailers were the first to applaud the adorable magnetic sets for toddlers with a 2017 ASTRA Best Toys Winner. Independent toy storeowners were soon joined by Parents’ Choice, Oppenheim Toy Portfolio and Family Circle magazine in their glee for these edu-tainment toys. In addition to the joy of clicking pieces together or pulling them apart as magnetic magic is discovered, toddlers pick up quite a few benefits during play. Parents will notice how hand-eye coordination, logical thinking, color recognition and creativity are stimulated and nurtured with a few rounds of play. 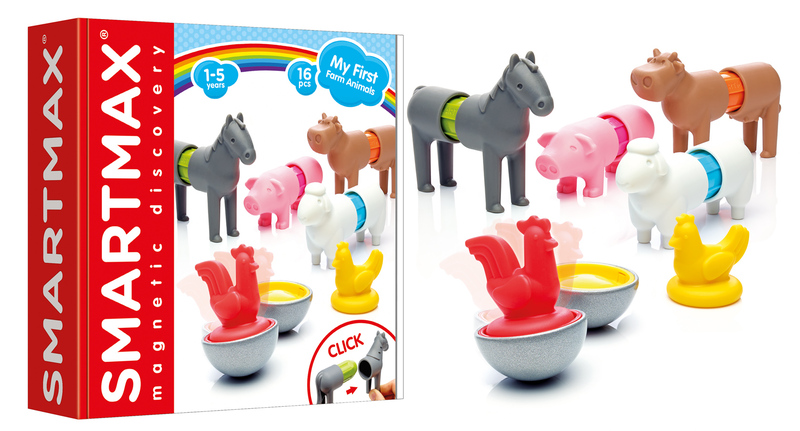 With a moo moo here and an oink oink there, little ones will delight in clicking magnetic pieces together to create farm animals or a crazy combo of a half sheep/half pig. The set includes 16 pieces that can create a farm community of six different animals. E-I-E-I-O! Old McDonald would feel right at home with this enchanting set of tractor, trailer, horses and farmer. Preschoolers can use their imagination to create silly scenarios as they build — with a click or pull apart — the 20-piece magnetic set. Facebook and other Social pages @SmartMaxUSA. About Smart Toys and Games, Inc.
Smart Toys and Games manufactures bestselling brands SmartGames®, SmartMax® and GeoSmart®. Our products develop logical thinking and problem-solving skills in all ages through fun, challenging, constructive play. Each multi-level game from the SmartGames line is designed to move players through carefully sequenced levels of game play. Fun, durable and compact, SmartGames are perfect for travel. SmartMax construction sets enable children to explore the fascinating world of magnetism in a safe and creative way through making strong building structures and vehicles. GeoSmart represents the future of GeoMagnetic play, with innovative vehicles and a patented safety system. Additional product lines offered by Smart Toys and Games include Tangoes®, which is based on the ancient Chinese Tangram puzzle and combines artistic and mathematical elements to create a variety of designs; and online brain-building fun for both children and adults at www.SmartGamesLive.com. We help specialty toy manufacturers and retailers grow - since 1994! KidStuff PR offers many services from Press Releases to Contest Entries. We can help you get your product in front of millions of eager buyers. Our public relations services are individually catered to fit your unique needs for your unique product.